More for Maisy fans! A new storybook based on Maisy’s hit TV series is here, just in time for the crazy-for-Maisy preschoolers who have been clamoring for more. In MAISY GOES SHOPPING, Charley and our favorite mouse make a trip to the grocery store to buy lots of goodies for lunch. Wherever they go and whatever they do, Lucy Cousins’s lovable characters are a delight. 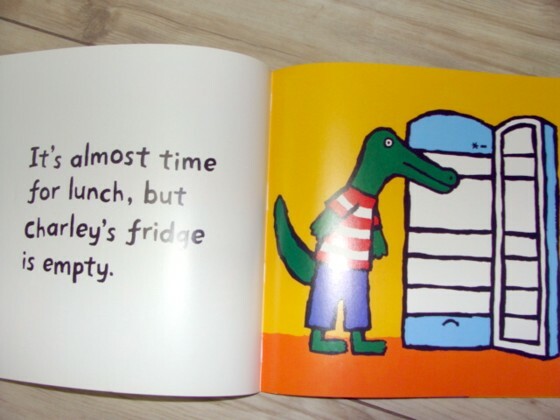 In this book Maisy and Charley go grocery shopping. My two year old loves grocery shopping and is fascinated by the book. We read it over and over and over. Actually it is great for me too, because I use it to talk about what kind of foods we can buy at the grocery store. Maisy and Charley buy apples, bananas, yogurt, bread etc... It is a good opportunity to get in a plug for nutritious foods. Lucy Cousins has illustrated numerous Maisy titles, including Maisy's House (Winner of the 1997 Bologna Ragazzi Non-Fiction Prize), as well as sticker, mix-and-match, colouring, board and story books based on the TV series. Among her other books are Noah's Ark; Katy Cat and Beaky Boo; Za-za's Baby Brother, artwork from which was recently used nationwide in the Tommy's campaign for premature babies; and Jazzy in the Jungle, a new novelty title. She has four children. MAIZY 的书以前借过一次,不喜欢,后来看了MAISY 的动画片,我这次借了3本MAISY 的书全都喜欢,自己还会主动翻着看,看到CHARLY'S 冰箱空的那页还问我:"妈妈,我们家的FRIDGE EMPTY 吗? "看到CHARLY 选了很多东西抱在手上时,就笑:妈妈,快看,CHARLY 买那么多.